The Medical Reserve Corps serves to help strengthen local communities’ emergency response during large-scale local emergencies. Become a part of DeKalb County’s culture of service and citizenship. Be a MRC Volunteer! The MRC is a component of the Citizen Corps. The Citizen Corps is a vital component of USA Freedom Corps. The program was created to help coordinate volunteer activities that will make our communities safer, stronger, and better prepared to respond to any emergency situation. It provides opportunities for people to participate in a range of precautionary measures to make their families, their homes, and their communities safer from the threats of crime, terrorism, and disasters of all kinds. MRC helps strengthen the community by bringing together local health professionals and other volunteers to assist the public during man-made or natural disasters, as well as contribute to meeting the public health needs of the community throughout the year. The Medical Reserve Corps was established after the 9/11 tragedy, which showed that the first response to any disaster is a local response. Fortunately, thousands of volunteers responded to the disaster by providing much-needed resources in various ways. As a result of this spirit of volunteerism, the Bush administration set up the Citizen Corps. Trained volunteers assist regular medical response professionals during a large-scale local emergency such as an influenza epidemic, a bioterrorism attack or other hazardous events. The DeKalb County MRC unit supplements community emergency response systems as well as contributes to meeting the public health needs of the community throughout the year. 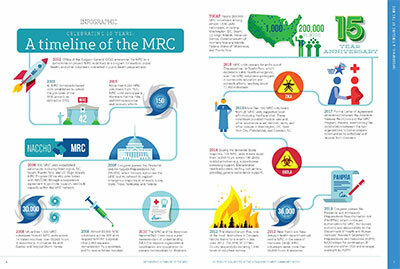 A Timeline of the MRC – Designed by naccho.org. In addition, volunteers may have skills in basic fundraising, grant writing, information management, graphic design and video production. During times of crisis, it is natural to want to serve others by volunteering. Whether it is providing help during a flood or manning a phone bank to help victims find sorely needed resources, there is a role we can all play. MRC volunteers are trained to provide assistance during a bioterrorism or natural public health disaster within their community. These critical roles will help save and protect lives. Everyone is needed from clinical to non-medical experts. Training in incident command, biological agents and community help center operations is part of the comprehensive training that you will receive as an MRC volunteer. In addition, community readiness and volunteer skills are tested in mock clinics. If you want to sharpen your skills in an interactive and invaluable way, please sign up to become an MRC volunteer. We aim to assist with all of the community needs during any disaster but we cannot achieve our goals alone. Click on the link below to find out how you can help. The collection of this information is authorized by 5 U.S.C. 301 and Section 2, Executive Order 13254, January 29, 2002. The primary purpose of the form is to provide a means that allows individuals to indicate their interest in volunteer services. Users may also elect to be provided with additional information about other service opportunities. Providing this information is voluntary. All information submitted by a user is available to DeKalb County Board of Health’s Volunteer Services.